Although rates of smoking have declined from a decade ago, nearly 10% of all 12th graders have used tobacco at some point in the last month. Over the course of a lifetime, smoking can be a very costly habit – negative effects on health and wellness, money spent on tobacco, and social stigma are just a few of the problems. The best way to spare your child the ills of tobacco use is to make sure they never start smoking. How do you stop your child from smoking that first cigarette? 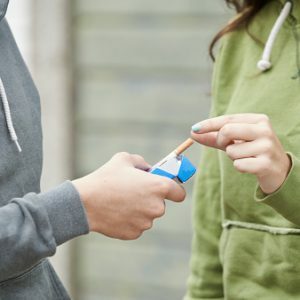 The best way to prevent your child from ever starting smoking is to minimize the number of people they see lighting up. 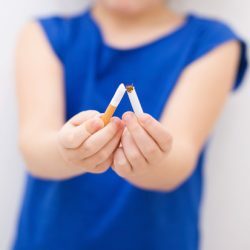 If you or a spouse smokes, keep it outside because children with a role model who’s a smoker are much likelier to light up themselves, another danger posed by movies and other media which portray smoking. Since those types of films now come with harsher ratings, it’s easier for parents to identify them and keep impressionable little ones from seeing cigarettes on screen. Talk to your children honestly about smoking. Explain everything from the serious health consequences to the lesser-known side-effects of tobacco addiction (bad breath, stained teeth, etc.). Consequently, if you do smoke, be open about the consequences you’ve suffered as a result of your habit and the difficulty you may have had stopping. These conversations with your child can start as early as age 6; ideally, you want to inform and influence their opinion of smoking long before someone offers them their first cigarette. Make sure your kids have the practical tools they need to never take that first puff. Try practicing turning down cigarettes with plausible excuses they can use if anyone offers. If your child is involved in sports, use this argument to influence them; ask them whether any of the professional athletes they admire are smokers, and you should get a resounding “No way.” Finally, as your children get older, inquire about their friends who smoke and explain that while hanging out with that peer group is okay, it may make saying no to smoking more difficult. They may not admit it but children need someone to look out for them and their health, so if you can prevent them from starting smoking you’ve done your job. Good luck raising a healthy, happy, non-smoker!